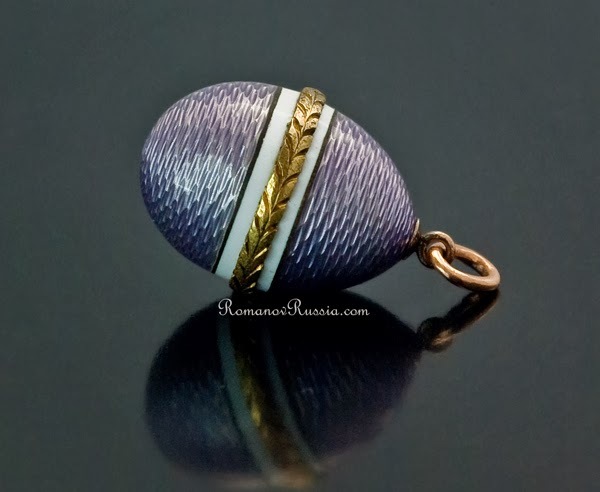 There are many, many Fabergé egg pendants left to go. So here comes another one - made by workmaster Henrik Wigström, sometime between 1908 and 1917! The egg is covered in pale lilac enamel over a guilloché ground. Around the center leaps a matte gold band of finely chased acanthus leaves with white opaque enamel borders. 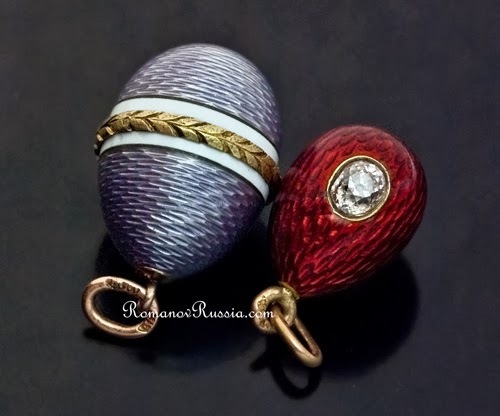 The size of the pendant is 13/16'' (2 cm), which is bigger than the usual Fabergé egg pendants - as you can see in the comparison picture above. The price for it is 18,500 USD, and it's for sale at Romanov Russia. Love these eggs Miss Meadows, so gorgeous as always.